Atmore Community Hospital (ACH) is a 49-bed, not-for-profit Short-Term Acute Care Hospital (STAC), providing acute care, emergency medicine, ICU, surgery, rehabilitation therapies, imaging and related outpatient ancillary services to the residents Atmore, Alabama and surrounding communities. ACH has been affiliated with Infirmary Health (IH) since June 2015. In addition to the services listed above, ACH also operates three Rural Health Clinics (RHC) in Atmore, a robust specialty clinic in Atmore and a Home health. Carla Brock Wilber, Senior Consultant, with Stroudwater Associates, worked with ACH in 2017, through the Small Rural Hospital Transition (SRHT) project, on a Quality of Care and Transition of Care Project. 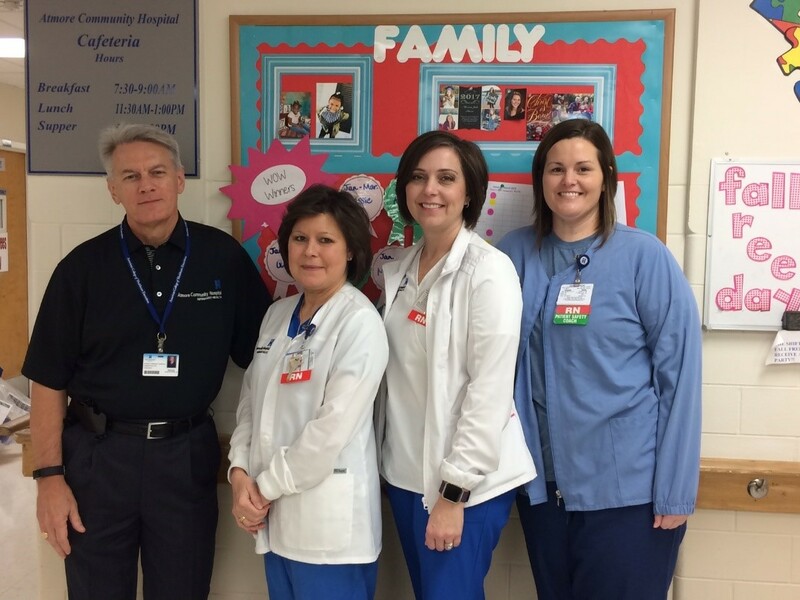 Center staff spoke with Doug Tanner, CEO; Suzanne McGill, DON, Brian Bruley, Clinics Director and Morgan Roberts, Nurse Case Manager, six months after the implementation of the consultant recommendations to discuss their progress. A: Most important is that the team met every Thursday to address the action plan. This frequent attention to the implementation of the action plan items was key. They continued to add their notes to the plan and completed the action items before the holidays. ACH focused on maximizing the effectiveness of leadership rounds. The CNO had always rounded on patients daily and now gives the CEO a list of patients admitted the prior day so that he can visit those patients when possible. This has been a worthwhile addition. The CEO created a “script” that he uses in his rounding that is tied to HCAHPS items including patient experience with food, transition of care, environmental services and medication side effects. CEO reports, “I am discovering and confirming that we have amazing staff that provide care.” Rounding has become “the best part of my day.” During rounding, leaders discover small issues such as a phone missing in a patient’s room or a patient room entry door latch that doesn’t work. In these instances, the CEO immediately informs nursing and these issues are usually corrected immediately! Leaders post patient comments from rounds in the staff lounge. ACH reports that HCAHPS scores had soared above their goals but have been more challenging in January and February because of the flu impacting a high census while at the same time, staff being out with the flu. The consultant suggested that ACH increase the marketing of the services they offer and let the community know about their accomplishments. They utilize materials provided by the Alabama Hospital Association each month that can be used for Facebook posts. They schedule posts for the entire month and tie special services to the monthly marketing. For example, February is “Go Red” so they offered heart-related activities. ACH also uses this as an opportunity to share about high HCAHPS scores and other services. To improve clinic operations, ACH tracks clinic patient satisfaction scores and they share data with staff during meetings. If needed, this information can be used to provide coaching to staff. They have also used this feedback to create scripting and expectations for staff in specific patient encounters such as when the patient presents at the admission window. They recently received access to a shared diabetes educator and are still considering where to best utilize a transitions of care coach to address chronic care issues of diabetes, COPD and congestive heart failure (CHF). In November 2017, ACH held the first meeting of its Community Health Partners Consortium. Patterned after another hospital’s initiatives, the purpose is to identify issues and challenges in transitions of care that could impact effective handoffs between the hospital and other post-acute providers. The initial meeting was very well attended by about 20 people and included representatives from hospice, nursing home, tribal clinic, county health department, assisted living and local pharmacy. The main question was “How can we fix issues?” This resulted in the identification of areas to improve communication among the partners concerning care provided to their common patients. This group plans to meet quarterly. To improve emergency department (ED) operations, ACH made changes to the way they monitor patient experience. Utilizing an iPad satisfaction tool that can gather immediate feedback, this workgroup modified their questions to be in line with its existing ED post-discharge patient experience survey questions. They are tracking transfers and identify patients that could have been served at ACH. All recommendations to improve handoff have been completed and that process is going well. Next steps include focus on staff accountability and continuing to look for “next opportunities” beyond the initial action plan. Q: What has been the impact of this project so far on ACH?